Solid Silver Meteorite Spaceman Necklace - A CLASSIC! 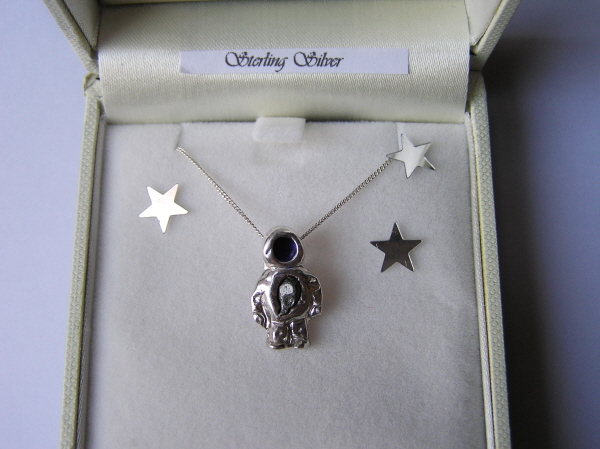 << Back Solid Silver Meteorite Spaceman Necklace - A CLASSIC! This is a super little piece of meteorite jewellery. It is a handmade solid silver spaceman (measuring 1.5cm top to bottom) with a piece of genuine Campo Del Cielo iron meteorite set into his chest like a little control panel. The visor has been skillfully enamelled in blue and the spaceman is hung from an 18 inch solid silver curb chain. This is one of the all time best sellers at Jurassic Jewellery and has been sent to many people, ALL around the World! It has even inspired other pieces such as Spaceman cufflinks, earrings and rings! Boxed and labelled with signed certificate of authenticity and an A4 meteorite information sheet. This is a useful introduction to the amazing world of meteorites! Solid Silver Spaceman Ring - A NEW CLASSIC!